If save-for-later service Pocket had a spirit animal, it’d be the American field ant. Like the insect, the startup supports that which is many times its own size. It serves its 20 million registered users — who have saved over 2 billion articles and videos for later — with a team of just 20 employees. At the center of this supernatural ability and efficiency is founder and CEO Nate Weiner. Pocket just celebrated its eighth birthday — but for roughly half of the company’s existence, Weiner was the sole employee. On his own, he built and designed Pocket’s website, API, iPhone app and iPad app, and fielded support requests from his first few million users. Pocket is proof that size of team doesn’t equal scale of impact. In this exclusive interview, Weiner explains why scaling a company doesn’t always mean increasing headcount (and burn). Instead, he shares the two ways startups can grow a business without a marketing or sales team, and the incredible advantages of staying small for focus, culture and trust. Any early-stage company that seeks to punch above its weight can benefit from Weiner’s exceptional (in more ways than one) experience with growth. Today, Pocket is in the process of moving into a new office to fit its now quickly growing team (targeted at two dozen by year-end), so it’s clear that success has shifted Weiner’s perspective, at least a little. 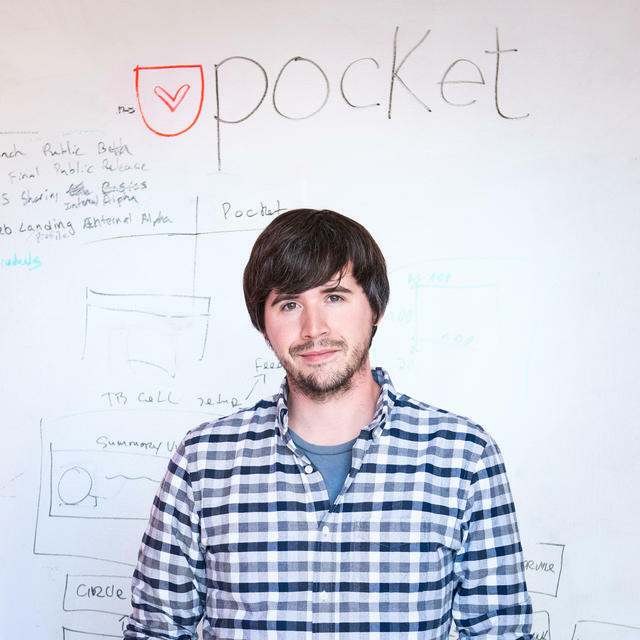 Still, he maintains how Pocket’s sustained smaller size in its early years was formative to its long-standing winning streak. And even now, he doesn’t want any sudden moves to lose or dilute the very traits that got the company where it is today: focus and trust. Below, he shares how keeping a team small can be an invaluable guiding principle. Management mantras harp on the importance of focus and staying nimble for startups. But they tend to leave practitioners to will clarity and agility into reality. Like any other startup, Pocket struggles with staying focused while prioritizing the many inbound or upcoming opportunities it’s always juggling. Unlike most companies, it views its small headcount as a means — not a limitation — to focus. Pocket only completed one-fourth of its projects slated for the first quarter. With so much in motion, the team felt dispersed and directionless. “It didn't feel good,” says Weiner. “Then we got word of a marquee project: Mozilla wanted to build Pocket into every version of Firefox that people downloaded. That integration caused the entire company to focus on one thing. It took me back to the early days when we were just five people, and how we attacked one goal at a time with all of us behind it. We rallied together to do the integration quickly, all while furthering Pocket’s mission of giving more people access to the content they want for later enjoyment." If you’re over 100 employees, find a way to manufacture the same scenario. Think back to the time when your company could fit into one room, and ask yourself if you’d put everyone on the project if you could. If the answer is yes, consider deploying more reinforcements from your current team. “Even at 20, 30 or even 50 people, you should really just be focused on that one thing that needs to happen right now,” says Weiner. Pocket is now shortening its project runway to under 30 days — especially for engineering sprints. “I can tell you where we're going six months from now, but we try to focus a month at a time. A small team enables us to operate this way,” says Weiner. At larger companies, entire roles or departments are charged with defining and preserving culture in order to absorb hundreds of new hires. As Pocket’s sole employee for its early years, Weiner was both the only creator and custodian of its culture. While he knew he eventually needed more than one person to scale the company, he didn’t want to lose the drive and grit that had landed him early success. With a small headcount, Weiner was able to keep Pocket’s culture concentrated during its formative years. This was possible because its culture wasn’t a fuzzy concept — it meant trust, scrappiness and ownership. Weiner had years to discover and refine founder-culture fit with the same rigor that most apply to find product-market fit for their companies. After all, there’s a saying in tech that 80% of your eventual culture is your founder (literally their personality traits). Think stews not salads when it comes to company culture. Start by letting a few choice ingredients simmer together. Then taste. You’ll have a better palate for what it delivers and lacks than if you toss it all together from the start. A small startup can use its size to force focus and better preserve culture as it grows, but these benefits are just the fuel for the work the team has to do. Its output — the actual product — can also scale without increasing headcount, but only through two channels. “The only way a product can grow from a team of our size is if your platform carries you or your users carry you,” says Weiner. The advantage of being small is that you find ways to make people outside of your walls part of your company. In the early days, Weiner made it his goal to embed Pocket in every corner of the web. The intent was to create an “amazing consumption experience” for as many people as possible across all of their devices, which meant the app itself had to be extremely flexible and scalable. Without a sales or marketing team, Pocket made its app as simple and straightforward for other companies to learn about and integrate its service — which, in turn, has exponentially grown Pocket’s users. To date, the company has tallied over 2,000 integrations, among them Firefox, Twitter, Flipboard, and Kobo. With strong partner feedback and enthusiasm, Pocket now seeks to grow as fast as it can through its platform. Weiner sees tons of opportunities, but there’s more out there than Pocket could possibly build with its current team — even if headcount doubled instantly. Make it dead simple and low-lift. The team at Pocket relies on this question to make decisions: how can we make it simpler for all involved? For example, it’s now commonplace for startups to share their APIs, but Pocket takes it a step further. “Yes, the APIs that we build on as a company are the exact same APIs we give to every partner publicly. But can you help them with just a few lines of code?” asks Weiner. Years ago, Weiner took on this challenge with the help of ShareKit, an open source Software Development Kit (SDK) that people could drop into their iOS apps. “I tried to make it literally one line of code for people to add Pocket and other popular services to what they were building.” says Weiner. “Companies could drop the line of code in and their app could share to any service like Twitter, Tumblr or Facebook. At the time, if you had to write the code from scratch on your own, it was weeks of work to set these things up. But I still wanted to make it simpler.” This is the same philosophy that guides Pocket today. Not requiring people to reinvent the wheel means first making sure what you’re working with is as simple as a wheel. If it is, they’ll use it and there won’t be much reinventing needed. Pocket’s platform mentality has been a huge part of its growth. Allowing companies to build on its platform easily has been the first step, but scale happens when they can do so independently. “We’ve completed thousands of integrations without any business development — and the overwhelming majority without any support,” says Weiner. Woo big partners tenaciously with your platform, then keep them with transparency. Small startups who have users expressing this degree of passion should not miss the opportunity to direct that energy from expression into creation for the benefit of the company. For Pocket, that’s meant getting users to lend a helping hand to product development. Here are the two ways that Pocket’s users are supporting its next generation of products. Shift your Beta channel from delivery to conversation to co-creation. There comes a point for every startup when you’ve got to decide between perfection and progression. The first is a stable characteristic and the second is a dynamic conversation. Choose wisely. This approach was especially critical to Pocket 6.0, a prototype that the company uses internally. The team estimated that a full, public-ready version would take nine months to put out. “We were delighted by the beta and didn’t want our limitations to delay our users from experiencing it, too,” says Weiner. “So we decided to break it all apart. We laid out the five to six different releases that’d strategically get us there over a six week release cycle. So far, it’s felt good to get it out there, even if it’s piece by piece. We're getting feedback and signal back really fast. We listen, respond and incorporate it all. We also ship at the same time so users know they’re being heard — they’re like our remote team." If you have one arrow and you shoot and miss, you're screwed. If you can continually re-aim until you get to the target, that gives you a much better look at the bullseye. Use surveys to learn from "the PMs" among your users. Many startups use surveys as an engagement tool, and casually treat the results as a byproduct. Don’t just listen, really hear what’s being said and how. “I always remind the team to look past the basic gist of the results,” says Weiner. When users give you feedback on an obstacle, they almost always give you an idea on how to solve it. Segment your users into buckets. Pocket has divided its user base into “casual,” “core,” and “inactive.” The team makes sure to send surveys to a group within each category to ensure they’re learning from a representative sample. Lower the bar for participation. Pocket makes sure its surveys are easy to complete, which means they are less than five minutes long. Oftentimes, they’re even shorter. For the most part, the team prefers releasing two-questions surveys frequently than a ten-question survey released occasionally. Using tools to engage users, like surveys and Beta channels, and creating easy, low-lift ways for partners to extend and build on your platform are ways to scale your company without growing your headcount. That’s how Pocket continues to deliver despite its size. However, now that Pocket’s partners and users are becoming more active in shaping the future, they’re also influencing the startup’s definition of success.